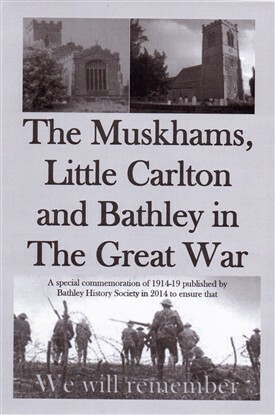 The Muskhams, Little Carlton and Bathley in The Great War reveals how 28 men from the community – 13 more than are on existing memorials – were killed as the result of the hostilities. It also explains how village men won bravery medals and how the women and children left at home coped. The booklet is on sale (£3) in WH Smith’s in Newark Market Place. Signed copies (£3.50 inc. p&p) are available from the author, Trevor Frecknall, at 9 Main Street, North Muskham, Newark, Notts NG23 6EZ; cheques made payable to T and GM Frecknall. This page was added by Trevor Frecknall on 23/07/2014.